We’ve said it once and we will say it time and again: winning awards isn’t what we got into PR for. But it’s nice when you do. It’s always an opportunity to see how the work you do compares to some of the best stuff going on in the industry. And in an agency world that thrives on an element of competition – whether for ideas, media space or new business – the odd awards do keeps you sharp. So it was with at least some pride that we took to the podium three times this week. 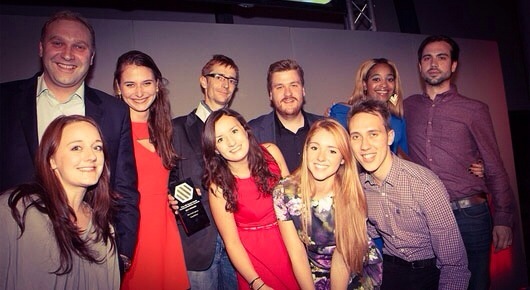 First we bagged PR Week‘s Best New Agency award on Tuesday against some stiff competition. Then we hit the stage again on Thursday at the SomeComms Awards to pick up gongs for Meantime’s Hops in a Box, which was named Best Social Media Campaign and were also named Best Small Agency. Massive plaudits all round to a great team of people who have done the work to get us there. And now we cross our fingers that we can repeat the feat at Digital Impact, Social Buzz and the PRCA.